Editor’s note: This article is an adaptation of the live webinar delivered by Steve Vernon in 2018. His comments have been edited for clarity and length. 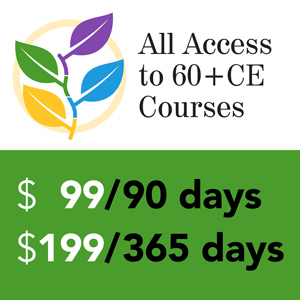 You may also choose to take the full length course Plan for the 21st Century Retirement for 1.0 hour continuing education (CE) credit. In 1900, life expectancy at birth was a little over 47 years; lately, it’s now over 78 years – more than a 30-year increase. This increase is a game-changer for the period that we call retirement. It’s instructive to think about, “What were the sources of the improvement in life expectancy?” It was an abundant supply of food, clean water, efficient waste removal, vaccinations, electricity – and these advances accrued broadly to most people in the population. What’s sobering is when we look to the future, future improvements may accrue more selectively to more informed, motivated, or capable groups. There are several studies which document a growing gap in life expectancy which are due to factors regarding education, ethnicity, income, wealth; in other words, there’s an increasing gap in longevity between the rich and the poor. Chances are good some of your relatives, and employees and customers are probably in this top half of life expectancy. 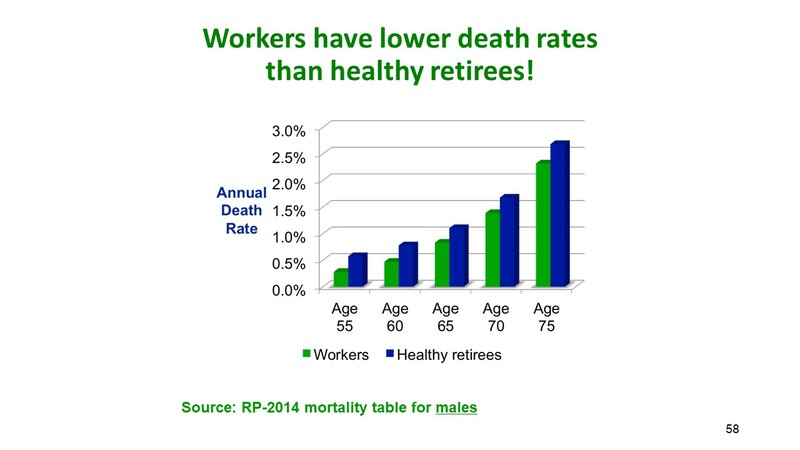 The way I look at it is that if your customers have a steady job at an established employer with good retirement health benefits, there’s a very good chance they’re in the top half – or the top fourth – of Americans in life expectancies. When you see statistics in the media about life expectancies, that’s for the entire population. There’s a good chance that your clients are going to be living longer than what you see in the media. However, longer lives aren’t the only game-changing trend. If you’re going to live for another 20 to 30 years, how many stock market crashes will you experience? It’s sobering to realize that in the 30-year period from 1987 to 2017 we had four stock market crashes, each one of which could have derailed someone’s retirement. If we’re going to live a long time we need to be prepared for stock market crashes when they happen, but without knowing when they will happen because we can’t predict when they will happen. Researchers are notoriously bad at predicting stock market crashes, but I can probably say with certainty that in the next 20 or 30 years, we’re going to have one – or two, or three, or four. Other game-changing trends are the demise of traditional pension plans and high costs for medical and long-term care. Some aspects of society work against a long, healthy, financially secure life; we have advertisements that encourage us to spend all our money, go into debt, eat unhealthy food and sugary drinks. Future improvements in life expectancy are going to accrue to those folks who are making healthy decisions. My new book just published in July is Retirement Game Changers. It represents my current thinking about focusing in on the strategies that will have the most impact and looks at the behavioral and economic considerations. It also represents a turning point for me, because in my prior books I assumed that all I had to do was educate people, show them all their alternatives, and they would pick the right choice. That turned out to be naïve. Our research at Stanford and other places show that we need to guide people to decisions and consider the behavioral considerations. It’s uncertain about how long you’ll live and planning for your retirement. This uncertainty is one of the biggest challenges that individuals face, and that you as advisors, will face in helping your clients. How much do genes impact your longevity? Research is showing is that your genes have about a 25 percent influence on your longevity, and lifestyle decisions have a more significant influence than your genes. This is terrific news for individuals with strong family histories of some cancers, heart disease, hypertension, rheumatoid arthritis, and many other conditions, but we now know that diet, exercise, and even medications may delay or eliminate the emergence of the disease. This also tells us that lifestyle decisions have more of an impact on our life expectancy than our genes. A 60-year-old woman in average health has a one-in-two chance of living to age 88, but she also has a one-in-four chance of not living beyond age 81 and another one-in-four chance of living beyond age 95. One in four – that’s a chance of drawing a club out of a deck of cards. 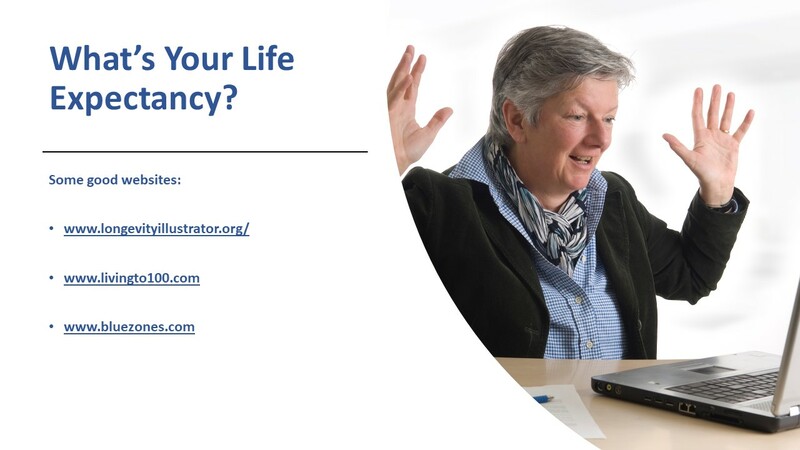 So, one part of planning for retirement is estimating your life expectancy. This first website I’ve listed here is the source of the numbers I just gave you, but here are some other sites as well. I hope your clients – and you – take away that, “If I knew I would live this long, I would have planned better.” We need to plan for today – because people want to have fun today – but they also want to plan for tomorrow, and most people need to lengthen their planning horizons. One of my favorite cartoons from The New Yorker is a man with a laptop, and he’s been doing some planning. He says, “If we take late retirement, and early death, we’ll just squeak by.” Well, at least he’s planning! We hope to show you a better plan. From the beginning we need to lengthen our planning horizon, because the research we’re seeing shows that people often just plan for two, or three, or five years out, and now we need to plan for the rest of your life. Left to their own devices, retirees tend to fall into two camps: the first camp hoards their savings, and they make minimal withdrawals; they greatly fear to outlive their savings. The second camp is the opposite: they’re oblivious to living a long time, and they wing it. They use their savings like a checking account – to spend on whatever they’re spending their money on. I think neither approach is optimal; this is where advisors like you can help people. You can help this first group set up strategies so that they feel safer spending more money, and they know they won’t outlive their money. The second group needs to spend more safely, and so this is where advisors can add tremendous value in helping people walk the balance between these two camps. Retirement income planning involves trade-offs; there’s no perfect retirement income solution, Different solutions can impact the amount of income you will expect to receive over your life. Do you have liquid wealth that you can access? Do you want to leave a bequest? Is it simple to implement, and have low costs to implement? It’s a lot to juggle, but I believe that people are resilient, so we don’t need perfection in all these areas. We’ve seen many surveys that show that people can adjust their living situation as their retirement income changes. When you think about it, you did this when you were working; when you were working, your income ebbed and flowed, and you just adjusted your spending to your situation. It’s no different in retirement. So often people expect or want to have an income that will not go down, but I think that’s unreasonable. We need to get people in the ballpark so that then they have enough resources that they can adjust to life events and the economic events as they occur. Let’s challenge today’s decision framework for deploying your retirement savings to last a long time. I’ve been working on several studies that have been a collaboration between the Society of Actuaries and the Stanford Center on Longevity, and it represents a substantial body of work. 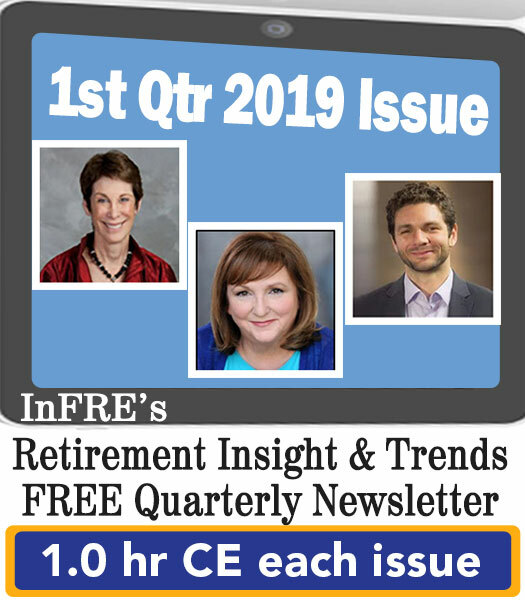 The latest was published in late 2017, and we looked at optimizing retirement income by integrating retirement plans, IRAs, and home equity. For these last two studies, co-authors have been Wade Pfau, and Joe Tomlinson whom I’m guessing are familiar to many people. I’ve been proud to partner with them to look at this research. This last research that we produced, we developed a framework for comparing retirement income solutions, and we compared 292 different retirement income solutions. In that, one of them stood out as being straightforward to implement and compared favorably to the other 292 strategies. We’re calling it the “Spend Safely in Retirement” strategy. This is an example of focusing in on one strategy that could work for people to use this strategy as a baseline, but then refining it to reflect individual circumstances and goals. The “Spend Safely in Retirement” approach involves building retirement paychecks. Retirement paychecks are guaranteed to last the rest of your life and won’t go down if the stock market crashes. You use these to cover your basic living expenses. You also want to set up retirement bonuses – and I’ve used the word “bonus” to communicate that this might go up if times are good, but it might go down if times are bad – and so you want to use your retirement bonuses to pay your discretionary living expenses like travel, hobbies, and spoiling your grandkids. Finally, you want to have a cash stash that you can tap for emergencies and not have to withdraw from your savings that are generating your paychecks and your bonuses. Sources of your income – paychecks – would be Social Security, pensions, and annuities. You want to have enough income from these sources that will cover your basic living expenses. Your retirement bonuses would be withdrawing from invested assets, work, and maybe income from other sources, such as rental income. 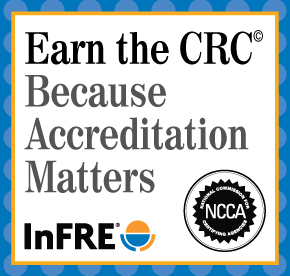 Your goal is to develop reliable sources of lifetime income. The Spend Safely in Retirement strategy has two steps. The first is to optimize Social Security usually by a thoughtful delay strategy. The second part is investing in a target date, or a balanced, or a stock index fund, and use the IRS required minimum distribution (RMD) to determine your annual withdrawals. I want to share a way of thinking about Social Security claiming. My yardstick for assessing a Social Security claiming strategy is, “What is the lifetime payout that you can expect?” Here is an example of someone who’s earning $75,000 per year in 2018 – born in 1960 – so they’re now 60 years old. 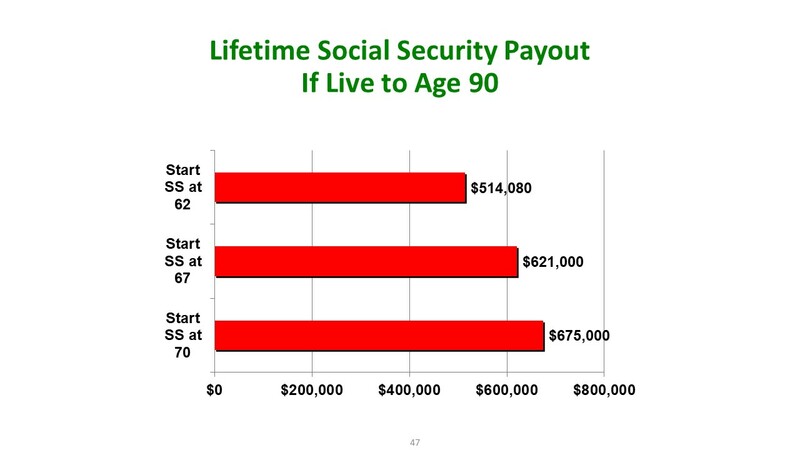 If they start at 62 – which is the earliest they can begin Social Security – their annual payout would be $18,360. For them, 67 is their full retirement age, and their yearly payout would be $27,000. If they wait till age 70 – which is the longest to wait, their annual income increases to $33,780. Let’s look at what their lifetime payouts might be. If they live to age 70 and then pass away, then starting at age 62 was the best strategy; they would have received $146,000 over that eight-year period. If they had started at age 67, they would have collected only three years’ worth of payments, or $81,000. If they live to age 80, it’s almost a dead heat as to which claiming age produced the most retirement income over their life, but if they live to age 90 starting Social Security at age 70 is the clear winner (as shown below). The lifetime payout isn’t the only consideration if you’re married, because delaying Social Security for the primary wage earner can also increase the spouse’s benefit after the primary wage earner passes away. That’s yet another reason to consider delaying your Social Security for the primary wage earner. Many people object to optimizing Social Security because they think Social Security is going to go bankrupt. This is because they see headlines that the Social Security Trust Fund is going to run out of money in the year 2034. What many people don’t realize is that the Social Security Trust Fund is just a supplemental source of funding. Current taxes paid by workers fund three-quarters of benefits, and so the trust could be exhausted, and you’d still receive about 75 percent of your benefits. Getting a 25 percent haircut is still a bad situation, but it’s not zero. As long as we have democracy and as long as we have workers paying taxes, we’re going to have Social Security. The real Social Security Trust Fund is just the ability and willingness for current workers to be paying their taxes – their Social Security taxes – into the trust fund that supports the benefits for current retirees. This is a generational deal that the current workers are paying these taxes on the assumption that their kids and grandkids will pay taxes, and so – for me – this is the real Social Security Trust Fund. I want to switch to Step 2 which is withdrawing from IRAs, 401(k)s, and retirement savings and three basic income generators. I call them “retirement income generators,” or RIGs to draw an analogy to cars and trucks. You can invest and withdraw only interest and dividends, and you keep your principal intact – that’s the most conservative way to generate retirement income, and it’s also a good way for people who want to leave a bequest. You can buy an annuity from a well-rated insurance company. Now there are pros and cons to each of these approaches, and they each generate different amounts of income. I believe one is not better than the other; it depends on your goals and circumstances. So how do we set up our retirement income? Retirees are particularly vulnerable to panicking during stock market crashes, because they can’t work longer, or they can’t work to make up their losses. You want to use invested assets for discretionary living expenses, and guaranteed sources of income for your basic living expenses. 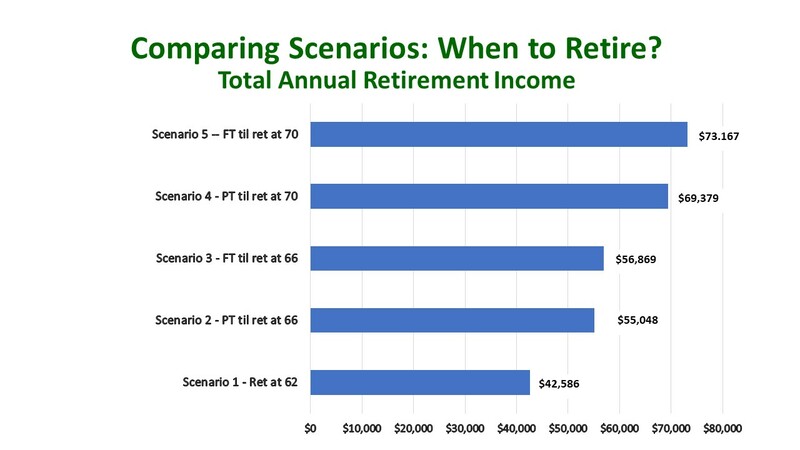 I want to compare some retirement scenarios. Here is a chart where planners can add much value. Let’s look at someone who is age 62; they have $350,000 in savings, and their household income is $100,000. Let’s look at five scenarios. If you look at Scenarios Two and Three, that’s just comparing working part-time to age 66 (Scenario Two) whereas Scenario Three is working full-time to age 66. Not a lot of difference in their retirement income. What that’s saying is those additional contributions between ages 62 and 66 don’t add much income. There’s a more significant influence on delaying Social Security and delaying drawing down your savings. Similarly, when you compare Scenarios Four and Five, there’s not a big difference in the annual income, and so for some people that small reduction in annual income might be worth it to work part-time and have more time to enjoy themselves than continuing to work full-time. Now, here’s another critical question: do you work longer, or do you reduce your standard of living? What percent of your household income are you replacing? I know it’s common to hear planners advocate that you need a retirement income that equals 70 to 80 percent of your pre-retirement income. The clear majority of workers just aren’t going to have enough savings to be able to do that, and so many people won’t be able to retire full-time at age 65 under their pre-retirement standard of living. Some people call this a retirement crisis; I like to call it a severe retirement planning challenge because you want to decide, “Do I need to work longer to boost up my replacement ratio, or is my retirement freedom worth it to reduce my standard of living?” The answer’s going to be different for everybody, but here’s where planners can add tremendous value in helping people think through and make this trade-off. Here’s one more chart using the same example. I’m showing the split of this total income, between Social Security and the drawdown. 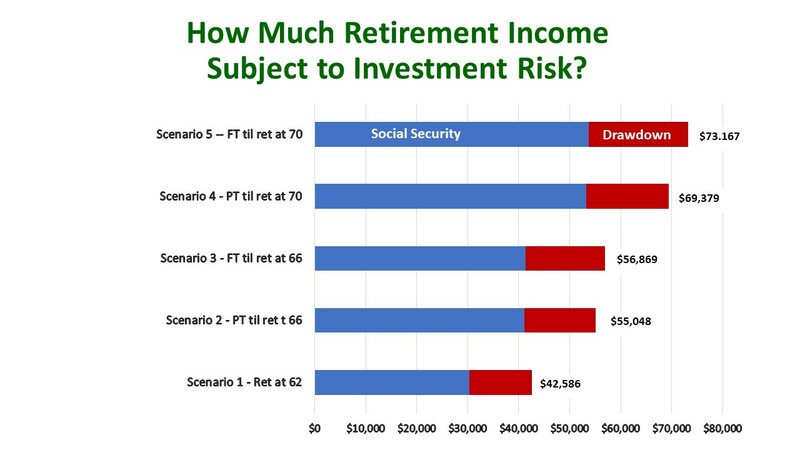 The drawdown represents the part of your retirement income that is subjected to investment risk, whereas Social Security is the guaranteed part of your retirement income portfolio. What we’re seeing is that if you optimize Social Security through a delay strategy, for many people, anywhere from two-thirds to 80 percent is coming from a source that is guaranteed to last the rest of your life, protected against inflation, and protected against stock market crashes. In theory, what that can do is enable you to invest more aggressively for the draw-down piece. This is an example of looking at the total retirement income portfolio and deciding how to allocate your assets for the invested portion, considering all your sources of retirement income. The 20th Century career trajectory was that you worked full-time, you kept getting raises, and there was more responsibility. Then you hit a cliff and you retired. Nowadays maybe a healthier trajectory is to phase down where perhaps you’re making less money, and maybe you have fewer responsibilities, but you’re still making some money and you’re still enabling your Social Security and your savings to grow. Now, teasing out this causation here is the subject of researchers like me who are fascinated by this. I can tell you right now, we don’t have proof – one way or the other – of what’s going on, but I happen to believe that having positive reasons for getting up in the morning and being engaged with life is what’s going on here. Working is one way to remain engaged with life – and have a sense of meaning and purpose – but there are other ways, like volunteering, and being active with your family, and pursuing your hobbies and interests. I hear that people say, “I can’t work longer” or, “People can’t work longer; they aren’t healthy enough.” This represents one of the big dilemmas that everybody’s going to face with these longer lives. This leads me to a strategy that I consider applicable to all retirees: consider spending just enough to truly meet your needs, and what truly makes you happy. This is another way that advisors can help their clients. If you can give them a picture for their income, and then say, “This is it. This is your income, now let’s look at your living expenses,” and this will help your clients make that trade-off between working longer and reducing their standard of living. These are the kind of insights that you as advisors can give your clients. Maybe we’re going astray of the pure financial expertise that you all have, but I think this is the way to differentiate yourself. We all know it’s a competitive world, and here is how you can really add value for your clients. Steve Vernon, FSA, MAAA, is a Research Scholar at the Stanford Center on Longevity, and is President of Rest-of-Life Communications. 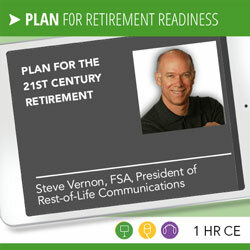 Steve Vernon shares practical strategies and ideas for enhancing finances, health, and lifestyle for the “rest-of-life” life phase, also known as retirement. With an effective mix of humor, stories, video clips, pictures, music, and cold hard actuarial analysis, he provides hope for working Americans with pervasive fear and anxiety about retirement. Steve is one of the most sought-after retirement experts in the country due to his surprising and inspiring insights. He is quoted frequently in such publications as The Wall Street Journal, New York Times, Los Angeles Times, USAToday, BusinessWeek, Fortune Magazine, Kiplinger’s, and Money Magazine. He also writes occasional columns for Retirement Weekly. ©2018, Steve Vernon. All rights reserved. Used with permission.